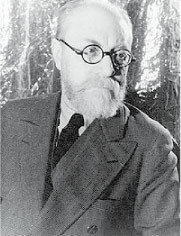 Henri Matisse was born on December 31, 1869 in Le Cateau-Cambresis in northern France. His parents, Emile Matisse and Heloise Gerars, owned a general store where they sold household goods and seed. Henri was their first son. As a young man, Henri traveled to Paris to study law. In 1889 he returned home to work in a law office as a clerk. It was around this time that he had an attack of appendicitis which required surgery. To make the long recovery more enjoyable, his mother gave him a paint box. It was then, at the age of 21, that Matisse discovered painting and decided to become an artist. In 1891 Matisse traveled to Paris to study art at the Academie Julian. Despite the fact that his first teacher told him he would never learn to draw, he was determined to succeed. In the beginning he painted still-lifes and landscapes and was beginning to see the results of his hard work. Five years later he exhibited 5 of his paintings in the salon of the Societe Nationale des Beaux-Arts. The state purchased 2 of them. In 1897 Matisse was introduced to Impressionism and to the work of Vincent van Gogh. Matisse was fascinated by this new and interesting way of painting and his style changed completely. His excitement for the art and artists of his time grew. In fact, he bought so many paintings by the artists that he admired that he got into debt. In 1905, Matisse along with a group of artists which became known as "Fauves" (The Wild Beasts) exhibited together at the Salon d'Automne. The paintings shown were expressive, often without regard for the natural colors of the subject. Matisse's works in particular contained aggressive brush strokes and bold primary colors. 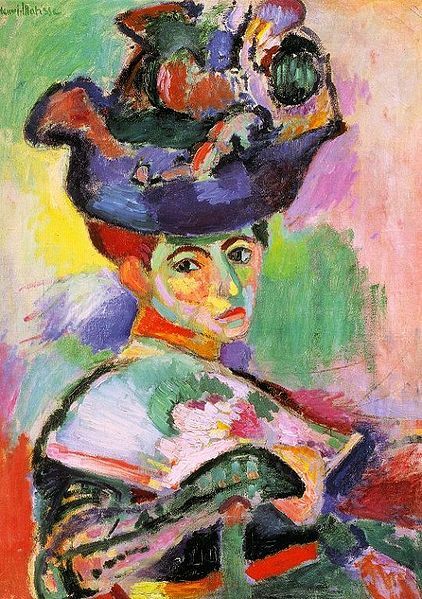 The show brought sudden fame to Matisse with his "Woman with the Hat" being purchased by American writer and modern art collector Gertrude Stein. In the 1940's Matisse began creating cut paper collages, often rather large pictures, called gouaches decoupes. He called this new technique "painting with scissors". His cut paper collages demonstrated his eye for color and geometry in a simple, yet powerful way. In 1954, at the age of 84, Matisse died a recognized leader in modern art. Although he was at first considered a Fauve (wild beast), he was later praised as a supporter of the classical tradition in French painting. Some of his greatest paintings include "Woman with the Hat" (1905), "The Dance" (1910), "Red Fish" (1911) and "The Moroccan in Green" (1913) Two years before his death a museum was opened to honor his work. It is now the third-largest Matisse art collection in France. The woman in the painting is believed to be Matisse's wife, Amelie.